Sprinkler is thermo-sensitive quarzoid liquid glassbulb burst actuated type and be standard products from an established firm of repute and standing and approved by an appropriate authority for fire fighting duty. It should be imported only. 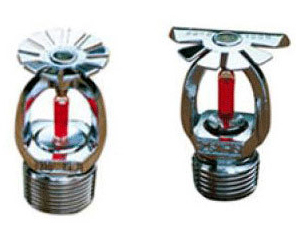 All sprinklers is brass castings polished / chrome OR white (polyester) unless stated otherwise and rated for 12.0 KG/CM2 WG and factory tested for 34.0 KG/CM2. Sprinklers is pendant OR side wall type as specified and shown on drawings. All sprinklers shall be provided with an adjustable OR Rosettes escutcheons finished same as the sprinkler head. Temp. classification of sprinklers in each space shall be as shown on the drawings. Sprinklers shall be selected for the coverage shown on the drawings and ordinarily be 15 MM. Wherever the specified sprinkler is not adequate. The tenderers may offer appropriate size required. Tenderers are free to suggest alternatively other suitable sprinklers with its justification.